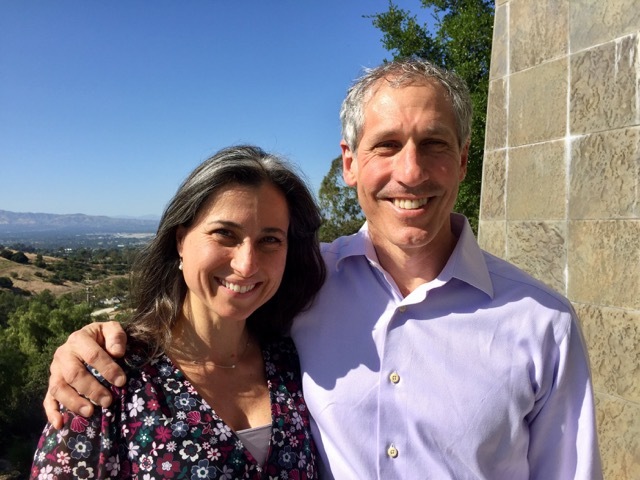 Los Angeles was fortunate in having ICEEFT Trainers Silvina Irwin (Los Angeles/Pasadena) and Michael Barnett (Atlanta) bring us Trauma, EFT for Couples, and the Therapist: Rebuilding Shattered Attachments Together on April 21st and 22nd, 2017. What a powerful two days! I know for me, there were a few main takeaways: First, always reassuring, is that working with traumatized couples takes longer than working with non-traumatized couples. For many in the room, taking away the idea that traumatized couples should be healed in 12 or 20 sessions was quite relieving. Personally, I knew it from experience, and from others saying so, but frankly, it always reassures me to hear it from the Trainers! Also a key emphasis that Michael brought was a focus on the cognitive appraisal that the clients make in reaction to each other. This is the familiar “What do you say to yourself about you…about your partner…about your relationship” when this trigger happens?” Michael and Silvina slowly placing the appraisals into the progression of identifying the cue, the cognitive appraisal, the accompanying feelings, and the action tendency became so very clear as a part of good EFT work. There were several experiential portions that were so very helpful, and the one I found most helpful was on the self-of-the-therapist. In this, we broke into groups of four. We worked first with our “helper,” describing some of our triggers and also what we knew were our good qualities and strong points as a therapist. We described one of our very difficult interactions we’d had with clients as we were getting triggered while trying to be helpful. We had ourselves be the therapist, two people play out the scene we described, wait until we felt quite triggered as the “couple” played out the scene that was distressing for us, and then we could turn to the fourth person, our helper, to go through the sequence with us: The cue that triggered us, our own cognitive appraisals that we were making while we were failing, and then our helper could help us slow down, re-regulate, and bring back what we know are our good, helpful qualities. Then we could go back into the distressing scene and be more helpful, more calm, more self-assured of our helpful ways, and lo and behold – the scene began to change into something more helpful for the “couple.” To see the transformation in myself from a triggered, ineffective therapist to a renewed effective therapist in touch with her caring and love for the couple was powerful for me. It shows how much we, as therapists, need each other for our own re-balancing. “Thank you Silvina and Michael for such a rich and meaningful two-day workshop! The workshop was set up by the two Trainers with attuned sensitivity towards the participants, and this created a very safe and respectful learning environment from the start. There were many useful practical nuggets, which we could start using right away in our sessions with trauma impacted couples. The “fuzzy” and challenging areas of working with trauma couples were clarified and normalized, and left us more hopeful about doing this kind of work. The focus on the self-of-the-therapist on Day Two was particularly meaningful and felt absolutely crucial to the work that we do with trauma couples. Because of the safety, we were able to take healthy risks, go deeper into our personal blocks, and come out with a renewed sense of hope and passion for this work. Silvina and Michael together as a team brought helpful clinical wisdom. Their attuned and sensitive presence was a wonderful gift to all of us throughout the two days. It felt like we went through a special experience together as a group as we were also learning helpful skills. I experienced Day One as a delicious appetizer and first course, keeping me excited for more. Day Two was the hearty main course, and finished with a rich desert. I felt fully satisfied. I would highly recommend this workshop! I wanted to say how much I grew from attending the Trauma and EFT workshop. What really stood out to me was how Michael and Silvina helped me understand the importance of pacing, especially with trauma survivors who go out of the Green Zone of emotional regulation so quickly to either the Red Zone (anger) or the Blue Zone (shut down). As a homing pigeon for emotion, I never understood how I could use more cognitive appraisals as more solid ground when tracking the cycle till greater tolerance for emotion emerges. What a great revelation on another way to bring greater safety into my sessions. Thank you to LACEFT, Michael, and Silvina for an amazing workshop. The workshop really helped me to integrate a conception of trauma into the framework of EFT couples counseling. Some really useful takeaways: When there is active trauma and/or unresolved past trauma, the EFT couples work will take longer as we explore these issues and their impact on the relationship. Clients who have unresolved trauma may need more time to explore transferential feelings toward the therapist. Progress is often punctuated by setbacks. Unlike in individual therapy, we do not necessarily need to explore trauma in every detail–rather we explore the impact of the trauma on the couple relationship. Michael and Sylvina did an excellent job of creating safety in the workshop so that the participants felt comfortable sharing and exploring this work together. I was able to understand ways in which I can become overwhelmed working with trauma and develop a strategy for leaning into my strengths and resources to manage this moments more effectively. All in all, this was a wonderful workshop. While it can be hard to take two days out of our practice and/or personal lives, this was well worth the time. We all agreed that the safety and caring, and the plentiful time for experiential exercises just could not have been done in a one-day workshop. We all thank you, Silvina and Michael. And we encourage other EFTers to attend their workshop if you have the opportunity to do so.